Who Can Get a Death Record? Illinois State Statute (410 ILCS 535/25) governs who can be issued a certified copy of a death certificate. Death records can be obtained from relatives or those whom have financial interest in an estate. Order online! It’s fast, easy, safe, and convenient. Most orders are processed within 24 to 72 hours. This option includes overnight delivery. Click here to Order Online. When placing an order by mail, please make sure you use the Death Record Request form and return with correct payment. Incorrect payment will delay your request. In the area and need the death record today? Visit us in person at the Clerk & Recorder’s Office. We accept cash, check, and credit/debit payments. In order to get a death record you must be a relative or an individual who has a financial interest in the estate of the deceased. Use the information below to make sure you have everything you need prior to requesting a death record. What ID do I need for a Death Record ? 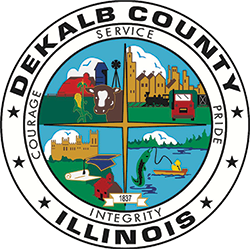 DeKalb County maintains several online databases for genealogical records outside of vitals. Log onto the DeKalb County USGENWEB Website at: dekalb.illinoisgenweb.org.